Square Enix has shown the Nintendo 3DS plenty of strong support with fantastic original titles like Bravely Default and its sequel. Though it’s still working on similar support for the Nintendo Switch, the company has promised that there’s lots to look forward to for its fans. One such thing we have to look forward to is Project Octopath Traveler, a beautiful, untitled RPG that we received a demo for on the eShop some weeks back. What do you think? Are you excited for this game? What did you think of the demo? Share your thoughts in the comments below. Still hoping for FF XII The Zodiac Age, FF X/X-2 HD Remaster, World of Final Fantasy, Kingdom Hearts 1.5 + 2.5 HD Remix , etc on Nintendo Switch. This game looks so beautiful and this music is absolutely amazing. When I first played the demo I was blown away by the sound design. The voice acting was pretty neat, but the environmental sounds and soundtrack were on a completely different level. Can't wait for this! 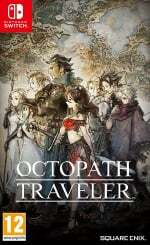 They should just call it Octopath Traveler. Everyone is pretty used to that name already. I like the Octopath name where OCTO (like in octopus > 8 feet) means 8 (paths). It makes sense. Nice music too. What an excellent piece! I can't wait for this. I am so pumped for this game. The art style and music are great! This is a definite day one for me. Can't wait to get more info about the game. @Anti-Matter how about just buy a console that plays those games? I don't see why a new project should be poo-pooed in lieu of games which are playable else where. Just finished the score? so how far along is the game? Hoping this game is amazing. Sure seems to be pressing all the right buttons right now. Oh God this is glorious! I'm pretty sure at this point they are sticking with "Octopath Traveler". It's the name people have gotten used to and it pretty nicely tells you what the game's hook is. If anything they'll add a subtitle to it like "Octopath Traveler: The Something of Somethingorother" so that they can turn it into a series of games later adding a new subtitle for each game. @Anti-Matter Sounds like you need a PS4, as one of those games is exclusive and 2 of them are console exclusive, and likely won't come to Switch. I am surprised that SquareEnix is the one taking this game design route of returning to Pixal graphics as a mainstream publisher. I really would think Nintendo would be the first to embrace it. Unfortunately, I'm not sure SqE is doing a good enough job with this approach, or at least the fact that their primary genre is RPG games will inhibit the success of those design choices. Meanwhile, I would love a Super Mario Bros 3 style Mario with 200 levels and a ton of environments and creativity. If the demo is any indication, it's going to be great! @YANDMAN Music is generally recorded pretty late in the process (specially when dealing with live music), but it doesn't say that much about a release date. Oooooh. I like the music o/ Sounds so good. Haven't finish the demo yet since I'm still playing other games but the little I play makes me excited for this ! Can't wait. I really hope Square Enix and Nintendo will finally make Super Mario RPG 2 and with “Retro-HD” graphics (I think that’s how Square called it) for the Switch. But that will most likely never happen. Well, I can at least dream about it. "Sounds like you need a PS4, as one of those games is exclusive and 2 of them are console exclusive, and likely won't come to Switch." I have owned the PS4 version, but still prefer all of them also on Nintendo Switch. "how about just buy a console that plays those games?" Well, i have owned those games. Will buy PS4 Slim on April 2018 according to my plan, but still i prefer those games appear on Nintendo Switch as well. I still feel Octopath Traveler is the perfect name. Though it might be interesting to see what else SE will come up with. I'm really hyped for the game! They could call it Bravely Octopath Travelers, since it's made by the same dev as Bravely Default and Bravely Second, that would make a lot more sense. Looking forward to whatever this game becomes, I really enjoyed the demo. I really liked the demo. I played through it with both characters. Art style is fantastic to me. Gameplay didn't seem too overbearing, so that's good. Hopefully some more decent stories, side quests and secrets around the game's world. Wouldn't mind a less tentacle-themed title! Surely the game must be almost finished if they've finished the soundtrack? I wouldn't expect them to record it all and then realise "oh wait we no final boss music!". I'm guessing that they're just polishing things for a release in the first half of next year. Really loving the music of this game. I still have the demo installed on my Switch because it's so gorgeous. @Anti-Matter You are only asking for what you already know, and dismissing the new- have you actually played the Octopath demo? I thought it was excellent. Don't be so closed minded. Octopath might be better than most of the titles you just wished for instead. The Switch is getting a beautifully crafted RPG exclusive, and as a fan of the genre, you reject it because it's unfamiliar? That's just plain dumb. I’m super excited for this game! I love the demo. Hearing the music just makes me that more excited for this. THIS is my most anticipated game of next year. The demo was moving and beautiful. I cannot wait for this game. Let's hope that Square Enix pull through and deliver a classic. I have watched Octo Path and unfortunatelly.... not impressed. So, i depend on older titles or something else that impressed me from First Impression. I'm in cause the demo was amazing. Couldn't resist clicking, the first 10 seconds sounds awesome, I'll be listening for the rest within the game itself. @Anti-Matter Watched, not played, then. I don't understand what's the deal with the final name of this game. I agree that 'Octopath Traveler' is widely spread now. I haven't own Switch yet. So, i can watch first from Youtube the Demo Gameplay. But, still not a fan of SNES Style RPG games. I will get impressed if at least proper 3D Rendering like FF III or FF IV NDS. If just only HD 2D style, Sorry... not impressed. I am super pumped for this game! I loved the demo!!! @Anti-Matter I'm confused- why are you rejecting a game that you haven't played, for a system that you don't own, in favour of games that are already out on other systems? There no logic, man. I'm absolutely the minority here, but I really, really didn't like this game (based on the demo). And I'm a HUGE RPG fan that grew up on classic FFs. I thought the graphics were muddy and ugly, town exploration was limited and lazy (like most RPGs these days), and the battle system was for lack of better words, 'meh'. I'm excited for those who are interested though. If i was not impressed even until i watched again for several times, that means No Buy from me. Octo Path ? Hm.... sorry. I pass. The old games that I have mentioned above on Switch ? Those games will suddenly caught my interest. I have those games on PS4 version, but i really wish if SquareEnix consider those games ported to Nintendo Switch because i prefer play those games on the go rather than being sticked on TV Forever. Yes, i got those lovely games, it's Perfect for me, but if Switch version available , it will Exceeding my Expectation. Even Better than Perfect. Not a fan of HD 2D Style Battle like that. They should stick with the name Octopath Traveler. It has a nice ring to it. I loved the demo (and the music) so I'm stoked about this. Hopefully they will release an ost. I'm a video game music aficionado. Oh yeah can't wait for the game too. The music sounds awesome and the demo was so good! I cant wait for this game! I was hyped about this game before the demo came out. Once I did play the demo, it did nothing but reinforce my gut feeling that it would be good. The Bravely Default team so far is doing a remarkable job yet again. It's not made by the bravely team though, it's made by Acquire, the guys who made the Tenchu games. Squeenix is just publishing it as far as I'm aware. I still hold that this will be a Romancing Saga titled game. I've been keeping an eye on this one. I've heard a lot of good things about the demo, and the soundtrack is certainly helping this game's case. @Tyranexx No Switch yet? Sorry I can't remember if you said you bought one yet or not. In the end I'll probably end up buying it, I'm hook on the story and would love to see what happen to the other six Octo characters, how they will meet, if any should died or how the story twist and if there's multiple alternate ending to each path. I don't think the story will have you play just all 8 of them but would be surprise if there's a ninth Octo character unlock at some point in the story. I'm hoping to at least knock out my remaining retail titles and a couple of the meatier VC entries. I should (hopefully) be getting a Switch sometime in 2018. Would it be weird if they left the name like it is? I don't really have a problem with it. @Anti-Matter I'm sure it would be cool on Switch, but sadly those three titles will probably never be on any other console than Playstation. I gotta say: the music in the demo was the best thing about it. Don't mean to say the rest was bad, but the music really stood out. Please tell me the person in comments demanding alternative releases did not say he doesn't own a Switch . @Anti-Matter Ever played Chrono Trigger? 2D RPG, Classic. Give Octo an actual chance before proclaiming that you don't like or want it. Maybe you'll get lucky, and those other games will come as well. Or PS4 owners are jealous that OctoPath is a Switch exclusive! If you dont like it because it's in 2D, it's more like a 2D/3D mix, that is actually great to play. Anyways, I've said my piece. The only person who stands to miss out is you, in the end, and that would be a shame. I said from beginning, i was not impressed. When people wasn't impressed, that means there are some things that not fit with their expectations, it could be don't like the art style or storyline or gameplay system or etc. I know also about Chrono Trigger , but i have never played before and not a fan of Akira Toriyama art design. I have ever watched the gameplay of Chrono Trigger from Youtube, but unfortunately still was not impressed. I don't have to like all the games, i'm a Pickier, i choose the games that fit with my criterias. If i don't like or not interested, should i have to be forced like the games even my heart say No ? "Please tell me the person in comments demanding alternative releases did not say he doesn't own a Switch ." I will buy Nintendo Switch on 31 December 2017. I have owned 10 Nintendo Switch games before i buy the machine. I also have FF X/X-2 HD Remaster, Kingdom Hearts 1.5 + 2.5 HD Remix, World of Final Fantasy on PS4 version. I will get FF XII The Zodiac Age later from my order from playasia. But i still haven't have PS4 yet. I play my PS4 games by borrow PS4 machine from my Gameshop owner at his shop. I have played my PS4 games at his shop since April 2017, but i only can play on Sunday and if the PS4 is not being used by my Gameshop owner. He's also play his games at his shop but pretty seldom. I ask first from him before i borrow his PS4. Played the demo and the music really stuck out. Can't wait. 1994 all over again??? I am seriously going to laugh when the reveal the full name is just "Octopath Traveler" dropping the "project" part. I'm really hyped for this one! It reminds me of the good ol' days types of RPGs. We really need more of those. As for those complaining that X game is not on the system, just move on. Final Fantasy not being on the system doesn't mean Project Octopath will be good or bad. If you dislike Octopath, just say it doesn't seem your cup of tea and move on. @jariw Yeah i assumed this was coming very soon and actually thought it was going to be out alreday. I think it is fine. But if the Amazon $59.99 listing is correct - I just think it will be a hard sell at that price.